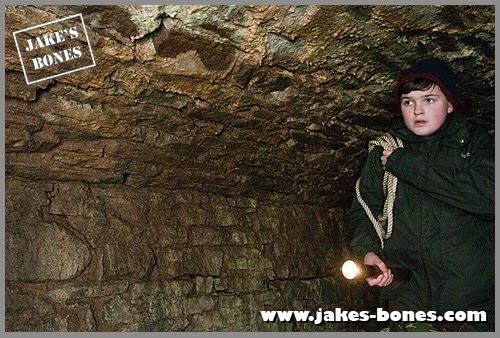 Exploring old buildings can be dangerous. . Talk to mum or dad about it first. Dads are more likely to say yes because they are sillier. This will be one of a series of posts this year that I will be writing for the history of my village which was founded 200 years ago this year. And I know it's not a great idea for child bloggers to list the place where they live, but it's been mentioned in pretty much every newspaper article about me ever, so it's no great secret. Just outside my village, there is one of the best preserved Roman forts in Scotland. 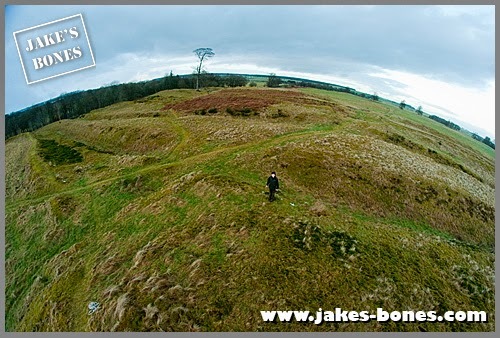 Most other Roman forts in Britain have been ploughed over , but at the Ardoch fort you can see all the old defensive earthworks, some of the edges of where buildings were, as well as lookout posts a few miles away from it in every direction. 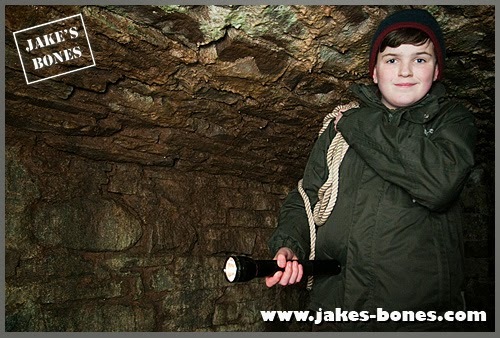 I'll write more about the history of the fort, but for now I want to tell you about the story of the legend of the Roman tunnel, the hidden treasure, and the discovery I made ! Here's the fort itself. It's to the north of my village, and each of those mounds and ditches were the defences along each side. You can read more about it on Wikipedia. But for now, I'm not as interested in the fort...as what might be beneath it ! The legend is that there was a tunnel that the Romans built under their fort which connects to Grinnan Hill, a former Roman lookout post at the south of the village about half a mile away. When the Romans left Ardoch, they expected to come back, and so hid treasure in the tunnel. So does the tunnel exist, and is there treasure in it ? There's lots of evidence that it did. In "Ardoch 2000" book by William C. Hutchison, the entrance was described as a round opening like a mouth of a well, and the tunnel initially went straight down. It says in 1720, the person renting Ardoch House, the estate next door, got tired of rabbits running down the hole to escape his dogs, so he had the mouth of the tunnel covered by a millstone and covered with earth. "There was near there a round opening like the mouth of a narrow well, of a great depth, into which my grandfather ordered a malefactor to go, who (glad of the opportunity to escape hanging) went and brought up a spur and buckle of brass, which were lost the time a garrison of Oliver's [Cromwell] dispossessed us of Drummond [Castle]"
He also found an inscribed stone from Roman times which is now in the Hunterian Museum in Glasgow. In 1690, another condemned man was offered the choice of execution of descending into the pit. He was lowered down on a rope, and brought up spears and helmets, and said that there was more treasure further down. But when he was lowered down a second time, he died from the gases in the shaft. 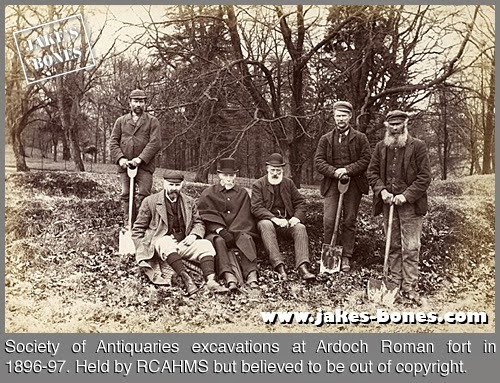 The treasure was kept at Ardoch House until it was looted in 1715 by Argyll's army after the Battle of Sheriffmuir. 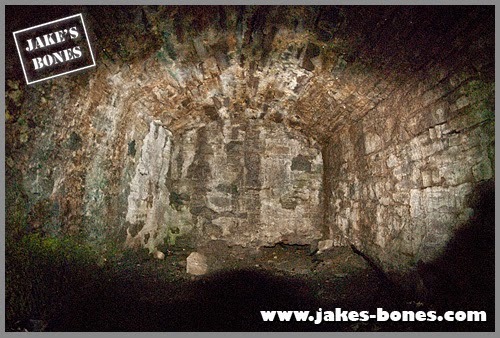 In 1695 the camp was examined by Sir Robert Sibbald who published his report in his Scotia Aniqua, and he said that there were caves or vaults below the camp. "there was a subterranean passage from the smaller camp, under the bed of the river is more than probable. There was a hole by the side of the praetorium that went in a sloping direction for many fathoms in which, it was generally believed, treasures as well as Roman aniquities might be found"
One hundred years later, in 1896, there were excavations at the camp which discovered shafts of seven or eight foot diameter going straight down under the camp, but which couldn't be excavated properly because of the cost of shoring them up. One of my neighbours, who is about 60 (not Mrs Currie, she is much older), remembered their grandparents telling them about playing in a tunnel near the village, which they called "the roman tunnel". They couldn't remember where the entrance was, only that it was in trees, and it was far too dark to explore far. But was this tunnel a different one, or a different entrance to the one described in the book ? So could I find it ? A while back, I decided to find out where the tunnel was. I had a hunch, and thought that if I looked along a certain area, I might find it. I spent a couple of hours, but didn't find anything. Then I was stopped on the estate by a man in a Range Rover. He wanted to know what I was doing, and instead of saying I was looking for the tunnel, I said I was out bone collecting, and told him about my hobby. Then I mentioned the red kites that I know live near by, and he seemed more relaxed. I mentioned the tunnel and he smiled. Did I know where it was, he asked ? He explained that he worked for the estate, and that when they first took it over it was his job to demolish the old Ardoch House, and also to stop people going into the tunnel, because they were worried about people being injured. He pointed me in the direction of the tunnel, which was an area I had searched already. The entrance was VERY well hidden ! It was a dead end. It looked like the tunnel had been bricked up. But was it a hoax? The tunnel looked newer , maybe a few hundred years old, and didn't match the description of the well-like shaft. But maybe it was built to connect with the shaft ? But if someone built it, surely they would have explored the tunnel to find treasure ? Maybe it was a different tunnel, not the Roman one. But what would it have done ? The tunnel also would have gone right under a building. Could it have been something else, like a storage place or an icehouse ? The third thing that was odd is that the wall at the end looked the same age as the rest of the walls, even though the tunnel was supposed to have been blocked only about 30 years ago. And if you were bricking off a tunnel, why not do it at the narrow entrance ? I used a special camera to try and look beyond the wall at the end - but all I found was stone and earth, at least two feet deep. If it had been filled in, it was filled in really, really well. This only occurred to me after I came back. What if the tunnel didn't go horizontally, but down at a steep angle ? What if when the tunnel was filled in, it was filled in at the end, but at the bottom ? What if the tunnel actually sloped downwards, and was filled with earth and then levelled off to make a floor ? I'll need to do more investigation ! I was pretty safe, I think. But I always put a warning on the top of posts like these about exploring. Firstly, hah! "Dads are more likely to say yes because they are sillier." So true. Also, it's really amazing that you live in a place with such a rich history and so many things to explore and discover. Thank you for sharing your amazing experiences with the world.